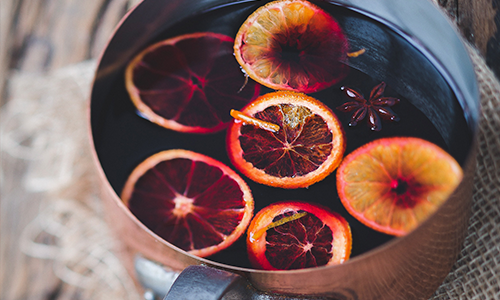 Nothing says winter quite like mulled wine. The spicy, warming elixir is the perfect way to experiment with a bottle of Col Campbell’s favourite, our Bobbie Burns Shiraz. STEP 1: Heat cloves, cinnamon, star anise, sugar, nutmeg, water and orange in a large saucepan over medium heat. STEP 2: Bring to the boil, then reduce heat to low and simmer for 10 minutes. STEP 3: Add red wine and simmer for another 5 minutes. Remove from heat. Strain and divide among serving glasses. Serve immediately.